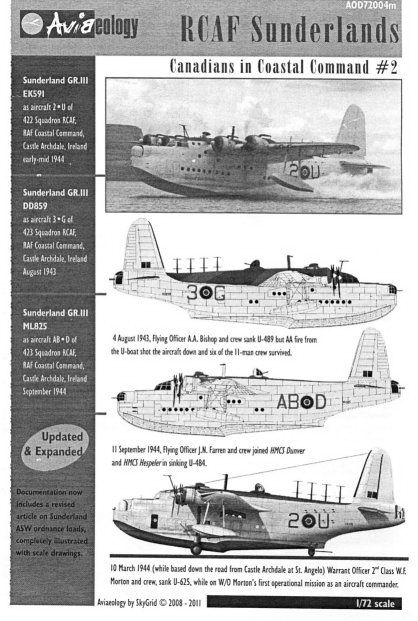 There are a small number of specialised aftermarket decal manufacturers who have recognised the need, and thus the potential market, for flying boat colour schemes and have produced some stunning sheets to enable modelers to 'ring the changes' away from the kit supplied schemes. Here, I am listing those that I have bought or those that have come to my attention. Where possible, I will inspect the sheet to give an honest opinion, however as time and money are always tight, I cannot possibly buy them all, so I will also link to the distributor so that you can make your own enquiries. Attention Decal Manufacturers and Retailers: if you wish to submit a decal sheet for review and inclusion in the Gallery please e-mail SEAWINGS by clicking here. 1/72 & 1/48 This new sheet from Canadian-based Aviaeology is absolutely first-class and a real treat for Sunderland fans, long-starved of after-market decal sheets for so many years. I can remember the Esci sheet from 30 + years ago - I still have it - but comparing that to this new sheet is like comparing a Model 'T' Ford to a 2012 Ferrari...! Well researched - thus accurate - perfectly printed, colours and registration are spot-on and the instructions are a lesson to all decal manufacturers; in short, absolutely superb. Three Sunderlands are featured making this one very attractive sheet available in either 1/72 or 1/48 scales. Available direct from Aviaeology; click here to go to their website to purchase. Canadair CL-415 Leading Edge Decals - 72:79 Leading Edge Models have done it again! This latest sheet is packed with colour enabling everyone to produce a stunning Italian fire-bomber that will really stand out on the model shelf. This set comprises comprehensive decal location plans together with 3 separate sheets of accurate decals enabling ANY of the fleet to be built. Well done, Dave Koss. Put simply, Leading Edge Decals are the very best you can buy! Dave Koss - proprietor - is renowned throughout the modeling world for the care and lavish attention that he puts into every sheet he produces. This sheet features two different CL-215's from the Province of Ontario/Airspray for the Airfix/Heller kit, complete down to the smallest detail. Click here to go to his web site for more details. This Leading Edge Decals sheet features the gorgeous Green and Red scheme of a CL-215 flying with the Newfoundland Province for use on the Airfix/Heller kit. Once again, the finish is to the highest standard with instructions printed to the highest detail. Click here to go to his web site for more details. 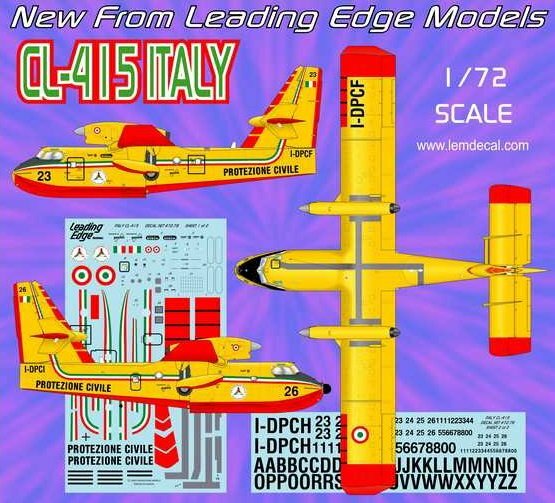 Another superb sheet from Leading Edge Decals, this time for the Canadair CL-415 Fire Bomber. This sheet features CL-415's flying from the Province of Ontario again for the Airfix/Heller kit, complete down to the smallest detail. Absolutely superb. Click here to go to his web site for more details. Grumman Goose Draw Decal - Goose - 1 This series of 14 first-class decals by Draw Decals, a 'cottage industry' aftermarket private company, provides a colourful range of Grumman Goose markings that are well researched, superbly printed and are supplied with excellent instructions and reference material to enable any experienced modeler to finish their model to a high degree. Certainly, a complete collection of these would brighten up any model display shelf. Greg Drawbaugh, owner of the business, must be congratulated for choosing to supplement one of the best looking flying boats with some of the best decals available in the modeling world. Click here to go to the Draw Decal web site to order. This superb range, designed and developed by Gordon Parker, is another shining example of the art of privately produced aftermarket decal sheets each one covering a unique flying boat subject that the mainstream decal producers are unlikely ever to touch. Click here to go to Airline Hobby.com - the North American distributors - or here to buy them from Freightdog Models in the UK. The instructions are extremely informative giving a concise history of each 'boat and the placement details are the subject of highly detailed plans. Highly recommended.